(York, Pa., April 1, 2016) - Adding incentive to maintain a scorecard this season, the York Revolution have notched a franchise first by signing two players by the same name. 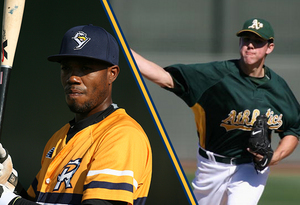 Outfielder James Simmons has re-upped with the Revs and will be joined by right-handed pitcher James Simmons. York has also resigned right-hander Cody Scarpetta and added righty Michael Click to the pitching staff in 2016. Manager Mark Mason announced the signings during Friday’s airing of “Revs Hot Stove Weekly” on SportsRadio 1350 WOYK. Acquired midseason from Bridgeport, the outfielder James Simmons put together a strong second half for the Revs in 2015. In 49 games with the club he hit .259 with 11 doubles, four home runs, and 26 RBIs. On September 7, he put the exclamation point on one of York’s biggest comebacks of the season, capping a four-run ninth with a walk-off single to give the Revs an 8-7 win over the Bluefish. Simmons followed that up by mashing two home runs in York’s 7-0 win at Somerset the next day. Simmons enters his 11th season of professional baseball. He was drafted by the Giants in 2005 and reached as high as Triple-A Fresno in 2011. Bridgeport picked Simmons up as a free agent in 2012 and he spent parts of four seasons with the Bluefish before coming to York last July. In 2014, he led the league with 103 runs, batting .295 with 58 extra-base hits and 67 RBIs while earning a nod to the Atlantic League All-Star Game and a spot on the league’s Second Team at season’s end. The pitcher James Simmons is no stranger to the Atlantic League having made a pair of appearances for Camden in 2014. A former first round pick by the Athletics in 2007, he made his professional debut in Double-A Midland that season. Simmons spent the next seven years in the Oakland system, losing the 2010 campaign to shoulder surgery, before moving to the Washington organization in 2014. Through eight seasons at all levels, Simmons sports a 39-37 record and 4.73 ERA over 190 appearances, including 99 starts. He made five separate stints in Triple-A, most recently making a start for the Syracuse Chiefs in 2015. Simmons also spent time with the Harrisburg Senators over the past two seasons. Brought in for five starts at the end of the 2015 season, Scarpetta went 2-2 with a 3.96 ERA over 25 innings for the Revs. In his September 8 outing at Somerset, Scarpetta hurled six frames of two-hit shutout ball, leading York to a 7-0 win over the Patriots. He followed that up with another six-inning gem five days later in Southern Maryland, allowing an unearned run on three hits and fanning eight in the Revs’ 11-1 trouncing of the Blue Crabs. Scarpetta was drafted by Milwaukee in 2007 and spent five seasons as a Brewers farmhand. After starting 2014 with Lancaster and making eight starts with the Barnstormers, his contract was purchased by the Atlanta Braves, as he spent the rest of the season with Lynchburg in the Braves organization. Scarpetta began the 2015 slate with Bridgeport before coming to York in late August. Through seven professional seasons, Scarpetta has struck out 492 batters in 483.1 innings of work. A graduate of Temple University by way of Penncrest High School in Media, PA, Click made his professional debut in 2011 with the Normal CornBelters of the Frontier League, making his way to Windy City in the same league for the next two seasons. He exploded onto the scene in 2013, notching 22 saves for the ThunderBolts with a 0.90 ERA and 71 strikeouts over 50 innings. After beginning 2014 with Lincoln of the American Association, Click signed with Camden for a successful season and a half, including a 1.97 ERA over 58 appearances in 2015. Click spent the past winter with the Canberra Cavalry of the Australian Baseball League, saving seven games with a 1.59 ERA in 19 games. The Revs now have 23 players under contract for the upcoming season. The club will continue to unveil player signings each Friday on “Revs Hot Stove Weekly” on SportsRadio 1350, woyk1350.com, and the WOYK mobile apps. Fans should tune in next Friday, April 8 at 6 p.m. for more player announcements.